US PRESIDENT DONALD Trump has accused those responsible for launching Robert Mueller’s probe into alleged collusion with Russia of “treasonous things against our country”, and said they “certainly will be looked into”. “There are a lot of people out there that have done some very evil things, very bad things,” he said, and added that this should never happen to another president again. His comments in the White House yesterday came as the Pentagon sanctioned around $1 billion (€880 million) to build part of the border wall with Mexico sought by the president. Democrats are now pressing for the full report of the Mueller investigation to be released, and say the president still has questions to answer. What has been published so far is a four-page summary from US Attorney General Bill Barr on the main findings of the report. Barr said that the special counsel’s investigation “did not establish that members of the Trump campaign conspired or coordinated with the Russian government in its election interference activities”. But Democrats are keen for more information on whether Trump obstructed the investigation, given Mueller’s assessment on the matter. “The Special Counsel states that ‘while this report does not conclude that the president committed a crime, it also does not exonerate him’,” Barr said. “All I’m interested in is them releasing the full report, the full Mueller report,” said Democrat, and House Speaker, Nancy Pelosi yesterday. Trump said yesterday that the release of the full report wouldn’t bother him at all, before hinting at action taken against those who instigated the investigation. While not naming names, one target of Trump’s ire for some time has been former FBI director James Comey. The president has repeatedly accused rivals, including Comey, of an illegal witch hunt into his affairs. Acting Pentagon chief Patrick Shanahan, meanwhile, gave the green light for the first funds designated for the wall project along the US-Mexico border. It will see 92 kilometres of 5.5 metre fencing built, the construction and improvement of roads, and the installation of lighting to support Trump’s plan. Shanahan “authorised the commander of the US Army Corps of Engineers to begin planning and executing up to $1 billion in support to the Department of Homeland Security and Customs and Border Patrol,” a Pentagon statement issued late last night said. The acting defence secretary cited a federal law that he said gives the Pentagon broad authority to build infrastructure “across international boundaries of the United States in support of counter-narcotic activities of federal law enforcement agencies”. 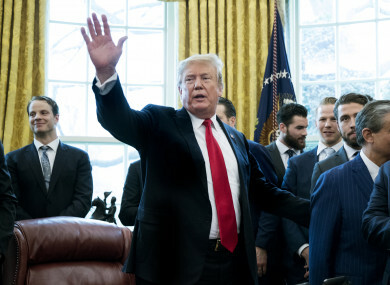 The White House has laid out an ambitious 2020 budget proposal which contains $8.6 billion (€7.6 billion) in new wall funding, above the $5.7 billion (€5 billion) Trump sought for this year. Email “Trump says 'evil' and 'treasonous' enemies will face scrutiny over Mueller report findings”. Feedback on “Trump says 'evil' and 'treasonous' enemies will face scrutiny over Mueller report findings”.